or how much can my truck tow? Ford put the towing capacity info in the owner's manuals, but many of those are missing today. In addition, in the early manuals the tables containing the info were quite long. For instance, in the 1981 manual there are 27 pages of complex tables. But, by 1985 someone at Ford had simplified things dramatically - there are only two tables covering the F150's, F250's, and F350's. So, those two tables are what I've put on the 1985 tab. However, by 1985 the F100 was long gone so the tables don't cover them. Given that I'm also including the two pages from the 1981 manual that cover the F100's on the 1981 tab. In addition, Bill Vose has supplied the 10 page towing section from the 1986 owner's manual, and they appear on the 1986 tab. "The Loaded Vehicle Weight is the weight of your vehicle as loaded for towing (including trailer hitch, passengers, and gear). Scales to weigh your loaded vehicle are available at trucking companies - usually listed in the Yellow Pages. The Maximum Gross Combined Weight Rating (GCVWR) - is the maximum combined weight of the loaded vehicle plus trailer that will meet the acceptance tests with your power train (engine, transmission, and axle). The GCWR can be found in the tables that follow based on transmission, engine, and axle ratio. If the engine type and axle ratio are not known, see the tables that follow the GCWR tables. Once these two figures are found, the GCWR minus the Loaded Vehicle Weight determines the Maximum Trailer Weight for your vehicle." Last, if you have the axle code off your certification label on the door jamb then use the tables on the Axle Ratio page to determine the gear ratio. 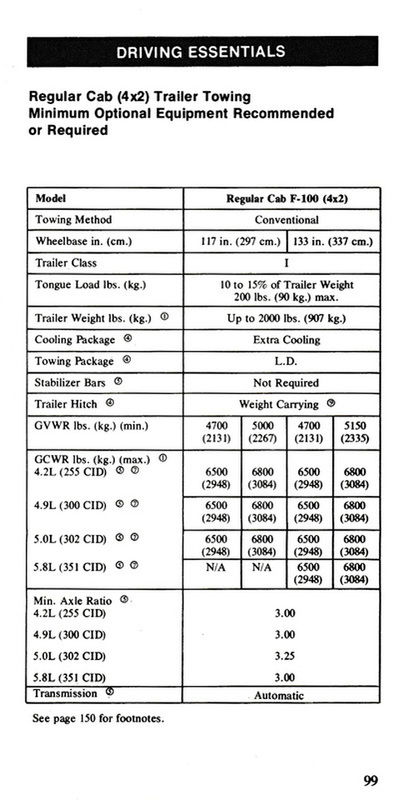 Included here is the 10-page Towing section from the 1986 owner's manual. Note that it has been scanned into a pdf and you can either read it on this page or click the pop-out icon and it will open up in a new window on your browser. The following is from the 1986 Ford Full Spectrum Recreation Vehicle & Trailer-Towing Guide, and provides more detail and in an easier-to-read format than do the owner's manuals.